Facebook has launched a page devoted to U.S. politics. 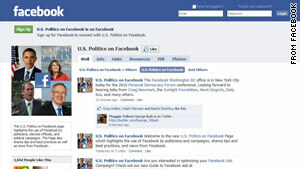 (Mashable) -- Facebook has launched a page devoted to U.S. politics, located at Facebook.com/USpolitics. Rolled out at the Personal Democracy Forum in New York City, the page monitors how U.S. politicians, elected officials and political campaigns use Facebook to connect with citizens. Facebook is an important part of U.S. politics today. Barack Obama has an incredibly popular page, with more than 8.6 million fans. Recently, U.S. President George W. Bush started his own Facebook page, amassing over 70,000 fans in a very short timespan. Facebook also has a similar page devoted to sports, as well as all of the celebrities who use Facebook.